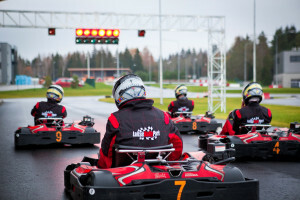 Only 30-minute drive from Tallinn city center and you will arrive to a theme park that is full of experiences, adrenaline and fun! like to see how experienced pilots are racing with old Lada VFTS rally car or then again with drift car. In addition we have a classic cars expo for you to visit and you may also rent one of those beauties with a driver for a special occasion or event. If you have been dreaming about driving with an old Soviet car then just get in touch and we will rent one to you. With kids we are glad to welcome you in traffic city and gamehouse. We also have 2 sauna cottages, where you can relax later after the races and barbeque or take a sauna! For more information and to make a booking please contact us by e-mail or call +372 626 6233.